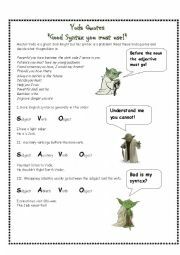 Yoda Quotes "Good Syntax You Must Use"
My students sometimes have trouble with syntax so I made this worksheet. It uses the character Yoda´s incorrect syntax to make the point. There are two pages, the second page has some exercises. 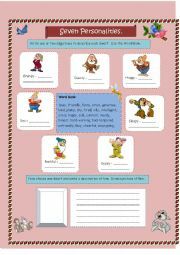 Use adjectives from the word bank to describe the personalities of the seven dwarfs. Then write a description of one. How Often Do You Recycle? 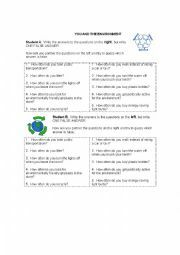 This is pairwork for beginner adults and includes environment vocabulary. It helps them practice the "How Often.." question. It has a fun element in that the student has to lie on one of the answers. 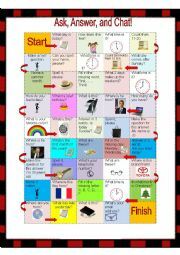 This is a board game I made for my very basic students to review some simple but varied phrases. 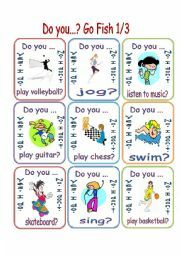 Go Fish game for practicing Free Time Activities and the use of Do you...? Yes, I do, No, I don´t. Instructions included in set 3. SIX EASY READERS "VACATION SPOTS FOR KIDS"
Six easy readers for very beginners about vacation spots for kids. Includes Legoland California, Lionel Train Center, Hersheypark, Crayola Experience, Tanque Verde and Toys R Us. Each reader has a task. 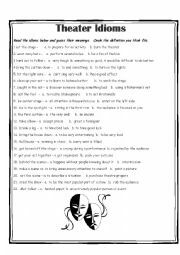 Simple worksheet for exploring the meaning of some theater idioms. Key included. Game for practicing MINE, YOURS, HIS, HERS. Suitable for Young Learners. The file was so heavy I had to Split it in 4. Thank you Edit Tentere for the template. This it the 3rd time I´m trying to upload this. Hope it Works. This is the second part of a tutorial and series of exercises about using the period (full stop), question mark and exclamation mark. It’s for younger learners and has a Calvin & Hobbes theme. I had to split it in two parts. I hope you like it. This is part 2 of a powerpoint that makes simple comparisons between Arctic Animals. It was very heavy, so I had to divide it into 3 parts. There will be accompanying handouts uploaded tomorrow. 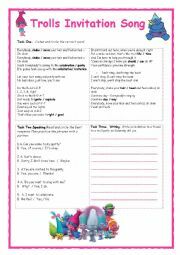 This is a multiple choice game for practicing the Irregular Past Tense Part 2. It’s from A-Z so it’s exhaustive so I had to split it up into 3 parts. I tried to use interesting or amusing pictures. THANK YOU ONCE AGAIN EDITE TENTERE for the template. This is part 3 of a powerpoint that makes simple comparisons between Arctic Animals. It was very heavy, so I had to divide it into 3 parts. There will be accompanying handouts uploaded tomorrow. This is part 1 of a game to recognize healthy and unhealthy habits. It´s for very young learners so there´s not much language. Thanks again Edite Tentere for the template. My students love Old MaId so I made this set with Halloween vocabulary for them. WARNING The images are a bit strong. This set is not for young learners. It’s for thrill-seeking teenagers. Instructions included. Go Fish game for practicing School Idioms. File includes entire set of 27 cards plus instructions. 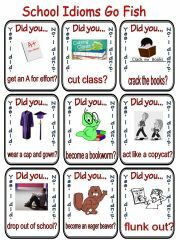 You can also use these as mini-flashcards or conversation cards. Look at the picture and choose the right word. Thanks Edit Tentere for the template. Happy Valentine´s Day!